Cats are any of the species of belonging to the taxonomic family Felidae. They include the well known members such as the Lion (Panthera leo), Cheetah (Acinonyx jubatus), Cougar (Felis concolor), and Domestic House Cat (Felis catus). Felids are characterized by their flat faces, slender bodies, sharp retractable claws, and sensitive long whiskers. Felidae is split into two subphyla, Panthera, the large cats, and Felinae, which are the smaller cats. All felids are carnivores, and as a result, have bodies highly specialized for hunting and killing prey. Every felid has such similar body design that only specialists can distinguish between several species' skeletons. Felids have a round head, many whiskers on the face, and a relatively flat face, large eyes and ears. Felid eyes have a tapetum lucidum to intesify light in the dark to help them find and kill prey. Additionally, felids possess a streamlined body and powerful limbs that also assist in predation. All felids have five toes on their forefeet, four on their hindfeet and retractable claws on every toe, with the exception of the cheetah, which cannot retract its claws. An elastic segment behind each claw retracts it into the toe when not in use to keep the claw sharp. Felid ears are generally able to rotate to some degree and their tongue has a rough surface that allows them to clean their fur and scrape meat off of the bones of their prey more easily. For all the similarities members of felidae share, body size and coat color vary greatly between species. The smallest of felids, the black footed cats (Felis negripes) weigh an average of 4.41 lbs., while the tiger (Panthera tigris) weighs approximately 661 lbs. Felids also exhibit sexual dimorphism, and males tend to weigh about 10%-15% more than their female counterparts of the same species. Felid coats vary greatly, with some having bright orange striped coats (Panthera tigris) and others possessing completely black coats (Panthera pardus). Spots or other such patterns are not unusual among cat species, and some species' coats may change greatly between infancy and adulthood. For example, cougars (Puma concolor) are usually born with spots but will most likely lose them by adulthood. The patterns of felid coats are designed to help them blend in to environments to avoid detection by potential prey. Felids are mammals and reproduce viviparously. After mating, the female carries the cubs for a period of gestation. A typical felid will have several cubs at one time, but usually no more than six per litter. Most cubs are born blind and remain so for about two weeks. Like all mammals, the cubs or kittens will be fed by the mammary glands of their mothers until they are grown enough hunt and eat solid food independently. Felids grow rapidly during their early stages of life and are generally able to eat solid food relatively shortly after being weaned by their mothers. Lifespan varies greatly among felid species, as well as the age of sexual maturity. During the mating season, which varies among cat species, a female will attract a mate by mating calls. After mating, the male and possibly the female will generally move on to mate with another partner, as most cats are polygynandrous and have multiple mates throughout a year. Pumas (Puma concolor) have a breeding season that lasts between December and March, and gestation in females lasts about 3 months. They typically have up to 6 cubs per litter and males will usually have multiple mates in the breeding season. A puma's lifespan is usually around 12 years in the wild, but may live to about 25 in captivity. Lions are somewhat unique in raising their cubs, as they are the only cat species to live in packs such as a pride. After giving birth to cubs, the whole pride of lions will care for each other's progeny immediately after. Lions have a lifespan of approximately 20 years, but the cat known to have lived the longest is Creme Puff(Felis catus), who lived for 38 years and 3 days. Felids are generally at the top of the food chain in any ecosystem they're in, as their diet consists almost entirely of other animals. Cats are natural predators and will hunt rodents, birds, reptiles, and some lions have been known to attack even elephants. Smaller cats generally prey upon rabbits and rodents, but all cats, if given the opportunity, will kill more prey than needed to survive. Additionally, cats will usually only eat prey that they themselves have killed. However, it is not unusual for a felid to eat carrion as well. Very few animals are known to prey upon cats, but cats themselves, especially large cats, readily attack each other. This is most common in felids who are intolerant of other heterospecific species; for instance, lions will kill leopards, who are known to attack cheetahs. Being an apex predator, felids greatly influence the environment they're in, mostly by way of population control. 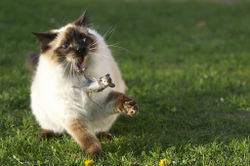 Cats keep herbivore and other populations in check by predation, and cat populations themselves are balanced by the availability of prey to hunt. Though having no predators in the literal sense, cats are vulnerable to a variety of parasites, including flatworms (Platyhilmenthes), roundworms (Nematoda), and many other such parasites. Ticks and mites are parasites very common for felids to host. Cats have always been a major part of history and ancient cultures around the world, even being revered as gods. In Arab history, cats were revered as pure-spirited creatures, and in the 7th century were said to have worshiped a golden cat. Muhammad was kind towards cats himself and cared for his cat, Muezza dearly. In a famous story, Muezza had fallen asleep on the sleeve of a prophet's robe. Muhammad, not wanting to disturb his cat, instead cut off the sleeve of the robe. It is also said that Muhammad drank from the same water that his cat drank from, as Muslims believe that cat saliva is sterile, unless the cat has obvious impurities in its mouth. In ancient Egypt, cats were highly revered animals, and not only helped in keeping rodent populations down, but were somewhat considered members of the family, and were even representatives of Egyptian gods. If a cat in a family died, members of the household would shave their eyebrows in mourning and give proper tombs to their cats, often burying them with milk, mice, rats, or other similar things. Killing a cat was considered a serious crime, as well as smuggling cats into other countries. ↑ Felidae Wikispecies. Web. Last updated 16 October 2012. ↑ 2.0 2.1 Shapiro, Leo. Felidae Encyclopedia of Life. Web. Last revised September 5, 2013. ↑ 3.0 3.1 Etnyre, Ericka; Lande, Jenna; Mckenna, Alison. Felidae Animal Diversity Web. Web. Last accessed March 24, 2014. ↑ 4.0 4.1 Klappenbach, Laura. Cats About.com. Web. Last accessed March 24, 2014. ↑ Clouded Leopard Defenders of Wildlife. Web. Last accessed April 6, 2014. Author Unknown. ↑ Toenjes, Nicolle Birch Anna. Felis catus domestic cat Animal Diversity Web. Web. Last accessed April 7, 2014. ↑ Domestic Cat Natural Sciences. Web. Published 2004. Author Unknown. ↑ Page Title Lions of Africa. Web. Last accessed April 6, 2014. Author Unknown. ↑ Oldest cat ever Guinness World Records. Web. Last accessed April 6, 2014. Author Unknown. ↑ TMO. Cats and Islam The Muslim Observer. Web. Published November 13, 2008. ↑ Hill, J. . Cats in Ancient Egypt Ancient Egypt Online. Web. Published 2010. 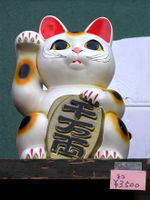 ↑ The History of Maneki Neko Siri Paradise. Web. Last accessed April 6, 2014. ↑ Cats in Russian Culture: Revered and Reviled touch of fur. Web. Posted May 27, 2013. This page was last modified on 26 February 2016, at 12:04.